When it comes to selling a boat, there’s a lot more involved than just hanging up a “For Sale” sign and then waiting for phone calls and emails to start pouring in. Most sellers aren’t entirely prepared for the experience, especially if it’s their first boat sale. The fact is, it’s always a buyer’s market in the boat business. The buyer, on any particular day, can easily find somebody willing to sell him a boat. Sellers aren’t so lucky. Sellers must wait to sell until their particular boat attracts the favorable attention of a willing and qualified buyer. The good news for sellers is that there are some very specific steps any seller can take that are time-tested, proven, techniques to market a boat faster and encourage higher offers. Boat buyers are like everyone else. We trust the sense of sight more than any of the other senses. How often do we hear an unexpected noise, or touch something unusual, and then immediately look to verify what we think we heard, felt, smelled, etc.? Making a boat look good, inside and out, is probably the single most important step a seller can take to attract a qualified buyer. Often, it’s not enough for the boat to merely be “clean”; there may be other clean examples of the same make and model available as well. Scrub, wash, shine, wax and polish until the old boat looks so good that you begin to wonder why you’re selling it- and prospective buyers will be wondering why they shouldn’t be first to make an offer. Do the brightwork, clean the decks, and polish the stainless rails and hardware. Clean the canvas and wash the windows. Don’t forget to scrub the bilge: a clean, dry bilge will almost always ad value in the mind of a buyer. If the engine is clean enough to eat off, it’s clean enough to sell. Almost as important as the visual condition of a boat is the presence, or hopefully absence, of odors. Even the cleanest boat will seem “dirty” if there are nasty vapors wafting from the holding tank. Buyers assume that a seller who just doesn’t notice the stench is probably overlooking some other critical considerations, or has had very little pride of ownership. The worst assumption a buyer can make is that a stinky boat “probably always smells this way” and most buyers aren’t going to award extra points to an odiferous vessel. Pump the holding tank before sale, and pour in something to kill the odor. Other smells, like spilled gasoline or diesel, stale water in the traps of galley sinks, funky refrigerant odors, and especially any residual suggestion of anything that overheated or burned should be identified and the cause corrected. Consider inviting a very frank friend aboard your boat to give it the “sniff” test. Our own noses play tricks on us- we begin to disregard smells that seem ever present in the environment. Anyone would think it extremely unusual if we were looking through a boat at one of the major shows and every drawer, every locker, and every shelf was cluttered with stuff. One of the best ways to get a buyer to conclude, “There isn’t enough stowage space on that boat”, is to have extra gear piled up on v-berths or a double layer of miscellany down in the lazarette. Once the boat is sold, all that stuff is going to go home or to the dump anyway, so why not clear out everything when the boat goes up for sale rather than waiting for it to sell? If you plan to use the boat while it is up for sale, it is still possible to remove the vast majority of personal stuff and miscellaneous gear. Be sure to leave anything that a buyer will expect to find aboard. If there are spare filters and belts for the engine, those are desirable. The 2004 West Marine catalog, your high school yearbook, photos of your pets and grandkids? Those can go. Getting strictly personal items off the boat helps prospective buyers visualize their own possessions in drawers and lockers and on shelves. It’s also a good idea to remove anything that isn’t going to be included with the sale. It’s much easier to get the buyer to accept your boat without asking you to “throw in” the $20,000 RIB and outboard if all the buyer ever saw was a set of empty chocks. This is a great time to change the oil and filters, for all engines and generators. When a prospect pulls a dipstick and finds some black goo well below the “full” mark, he or she will likely conclude, “This boat hasn’t been that well maintained, and I wonder how much oil she uses?” A fresh oil change and topped off crankcase inspires much more positive thoughts. Be sure the batteries are topped off, and kept charged. If one or more batteries are shot, consider replacing them now. Buyers often insist that a seller replace failing batteries as part of the deal, so why not be proactive and prevent that same failing battery from discouraging a long series of buyers? At a minimum, everything should work. Boats are sold subject to survey, and the adjustment most buyers are likely to demand in case of, (for instance), a non-functional ice maker will almost always be far more than the cost of repairing the system prior to sale. Price is much more of an art than a science. It might be possible to find out what boats of similar age, make, and model have recently sold for- but even then, those aren’t your boat. Sellers typically ask more than they expect to actually get for a boat, and buyers usually make a first offer somewhat less than they are actually willing to pay. Starting off with a realistic price, close to market, may prove more effective than offering a boat at a stratospheric number and being prepared to offer an astonishing discount. Remember, it’s a buyer’s market. Buyers tend to avoid boats that are obviously overpriced- there are usually some alternatives that may have been on the market for a while and the sellers’ advertised expectations have become more realistic. 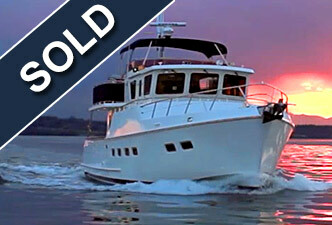 Nothing attracts a buyer faster than a good, clean boat offered at a realistic price. Buyers are often willing to make an offer closer to a realistic asking price, and may be less likely to go for a ridiculous low-ball offer. If a water main breaks under a house, the owner is likely to call a plumber. Important legal issues are best handled by an attorney. Most business owners have their taxes prepared by a CPA. Nothing prevents anyone from attempting to fix a water main, represent their own interests in court, or do their own tax return. However, it’s common practice to enlist a professional in any business situation where there is a substantial financial element. A good yacht broker will offer expert pricing guidance, and has at his or her disposal some effective marketing tools that are simply not available to a private seller. More often than not, selling FSBO can be a long, long, discouraging process of waiting for something to happen. A qualified yacht broker will have additional resources to help make something happen. One of the tools being effectively used by top-selling yacht brokers is video marketing. As already noted, sight is the most believable sense- and images that combine motion and sound are more compelling than a series of static snapshots. As far as the theory that a yacht broker will “cost 10%”? When there is substantial money in play and in situations where price demands and adjustments are common, it makes sense to employ a skilled, third party negotiator to represent your interests. It has long proven true that a professional representative typically improves the transaction by enough to cover all or most of the costs. Boat sellers should also appreciate that getting a boat sold quickly, and putting an end to the moorage, maintenance, insurance and possibly interest costs associated with ownership can have significant financial value. Expect a professional yacht broker to keep you well informed about showings and sales inquiries concerning your listing. If the boat isn’t drawing any inquiries (often a price-related issue), you and the broker should be discussing whether price, marketing strategy, or some other factor is discouraging potential buyers. If your boat is frequently shown, but not drawing any offers, it could easily be that some aspect of condition is turning prospects off. You and your broker should be discussing whether the best remedy is to correct the deficiency, or adjust the price to more closely reflect the value apparently perceived by shoppers. Using a broker, can, (in certain cases) permit a seller simultaneously buying another boat to affect a “trade-in”, and when that is possible the savings in sales tax will offset almost all of a broker’s commission. The vast majority of yacht brokers have high ethical standards and conduct business with integrity. Among the useful means for separating the true professionals from the part time or fly-by-night operation is to inquire whether the broker is a Certified Professional Yacht Broker, or CPYB. CPYB brokers meet some rigorous qualifications, including a minimum of 3 years’ experience as a yacht broker, and are bound to a code of ethics. An exhaustive course of study, as intense and comprehensive as many university programs followed by an exam, must be completed before a broker can be become a CPYB. 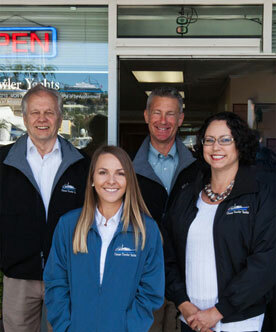 There’s no legal requirement for a broker to be a Certified Professional Yacht Broker, but those who take seriously their commitment to offer the best and most effective service typically pursue this designation. It’s well to remember that selling a boat is a process. The market is both smaller and more specific than many people imagine. Getting a boat into good shape before bringing it to market will help ensure that poor housekeeping or a “weird smell” don’t turn off everyone in the small group of buyers ready, willing, and able to buy a boat just exactly like the one you have for sale. Enlisting a yacht broker, and following the steps they advise to sell your boat, will result in a faster and hassle-free selling experience.